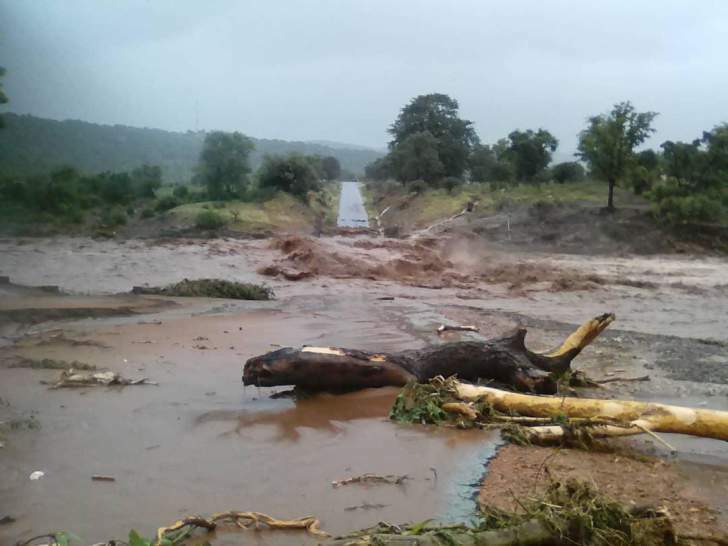 At least 31 people have died in Manicaland's Chimanimani district as homes and bridges were swept away by a tropical storm that began on Friday. Among those who died are two pupils from St Charles Lwanga Secondary School after a rock fall from a nearby mountain hit the dining hall. The hall collapsed onto a dormitory where the pupils were sleeping. A number of people were caught unaware in the mountainous area with dense forests that has become difficult to access as uprooted trees and rocks are blocking roads. Thousands were left homeless as houses were destroyed, most of them mud houses in the rural areas. Several people were reported missing. According to police, a bus carrying 12 people that was attempting to cross a flooded river was washed away, but nine managed to survive while three are missing. Information ministry permanent secretary Nick Mangwana said the government was making frantic efforts to rescue the victims but was facing challenges in accessing the affected areas. "The government has deployed both the army and air force on the ground, private ambulances, council ambulances and government ambulances and all emergency services are assisting in a coordinated way," he said. "The challenges are that a number of bridges were swept away and rivers are flooded and it is very difficult to access the hardest hit area, which is Chimanimani East. "The biggest challenge is accessing that area and that on the ground it is difficult as well to access the area from the air because of strong winds that are blowing into the area. "It is unsafe to fly into the area as well and that hampers air efforts to rescue those who are marooned. "The army is closing in from the ground and they are moving to rescue children who are distressed and stranded at Lwanga school." Mangwana said although the biggest number of fatalities was from Chimanimani East, the Rusitu area in the same district had five casualties. Mangwana said all rescue efforts were being coordinated via the Chipinge area where there was less damage. He said they were working with many partners to ensure that all vulnerable groups were assisted. "The situation is not ideal, but all humanly possible efforts are being made to ensure that people don't suffer unnecessary distress and save lives if that can be avoided," Mangwana said. Zimbabwe Red Cross Society head of communications Stambuli Kim said although some areas were inaccessible as a result of the damage, his organisation was working with various stakeholders in assisting the affected communities. "As Cyclone Idai wreaks havoc in Manicaland province with lives lost and some people injured and missing, the Zimbabwe Red Cross Society, working with the department of Civil Protection and other relevant departments and stakeholders, is on the ground delivering relief materials," Kim said. "We have our teams on the ground and the Red Cross as of today [yesterday] had delivered non-food items inclusive of 300 blankets, 300 tarpaulins, 20 boxes of soap, 49 mosquito nets, 300 buckets, 115 compressible jerry cans, and 15 000 water guards to the affected communities." Meanwhile, police spokesperson Assistant Commissioner Paul Nyathi confirmed that a TripTrans bus was swept away in Chimanimani. In Masvingo, the cyclone uprooted roofs at Mutimurefu Prison while two primary school pupils reportedly died in Bikita's Mukore area after the hut they were sheltering in collapsed. In another related matter, legislators from Chipinge attending a threeday Parliamentary portfolio committee on lands, agriculture water and climate and thematic committee on indigenisation and empowerment meeting had to leave hurriedly after distress calls from their respective areas. Mathias Mlambo of Chipinge East said he was cutting short his trip as many people in his constituency were displaced. "I can't be seen sleeping in a hotel when the situation is like this and I am told the Tanganda bridge has been damaged but I will find a way to go home." Acting Manicaland provincial administrator Wilson Boore said 67 households had been destroyed in Chipinge district. MDC spokesperson Jacob Mafume said they had received distress calls from party structures in Manicaland. "A serious humanitarian crisis is unfolding in Chimanimani, Chipinge," he tweeted. "Most of our structures' comms are down. We need state intervention on a massive scale to avoid biblical disaster, homes bridges being washed away, lives in danger." Zimbabwe has faced a severe drought this year that has damaged crops and a United Nations humanitarian agency says 5,3 million people will require food aid this year. The meteorological services department expects rains to continue throughout the weekend. Source - Additional reporting by Reuters.